The latest iOS 6 beta brings not only hopes of a more user-friendly operating system, but also hints that some carriers may restrict useful features. Today, it’s the curious case FaceTime access, a 3G service that AT&T may plan to charge users for. 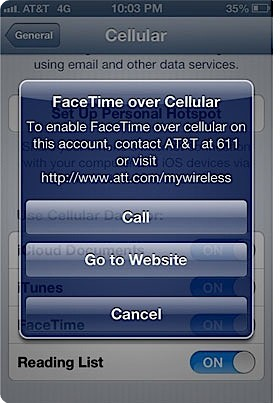 The evidence comes as an error page similar to the tethering dialog that appears whenever AT&T customers attempt to start FaceTime over the cellular network, while running the newest iOS 6 beta version. As it can be seen to the left, this error log advises the owner to contact its carrier in order to continue with the process. AT&T has the habit of limiting services that are free of charge over the ocean and when it came to FaceTime, officials have been keen to avoid any statements until the moment. Actually, when iOS 6 was unveiled at this year’s WDC, the carrier affirmed that it has been working closely with Apple but details will be shared later on. By the looks of it, the rumor is almost confirmed, with AT&T having only to gain from this little affair. Services like iMessage and FaceTime represent pure profit sources for carriers since all the traffic is transferred by the low-bandwidth carrier wave, one that does not represent an expense for AT&T.